Larry Smith, Author and Editor of "Six Words Fresh Off the Boat"
My grandfather, Morris “Smitty” Smith, was four when he came to America with his family. It was 1914, they were escaping the war in Russia and were lucky to settle in Philadelphia, where his father sold eggs door-to-door. They lived frugally by necessity. When they had a little extra, they sent money back to Russia so other family members could come to America, too. They worked hard and wanted what all people want: safety, shelter, food, family. Smitty grew up and earned a pharmacy degree, later opening up his own shop in a small town outside of Philly with this brother, Sam. It was called, naturally, Smith Brothers. My grandfather spent long days, nights, and weekends behind that pharmacy counter. He knew his customers by name. He knew their ailments, their prescriptions, their stories. The customers at the pharmacy were treated like family, and they trusted him as they did their doctor or priest. It was behind that counter that Smitty excelled at the most important part of his job: he listened. More than a century after Smitty arrived on America’s shores, his grandson is a third-generation American who finds himself in the same business as his grandfather. I don’t stand behind a counter, but my work requires me to ask people about their lives, and then to listen. I discovered a way to help people distill their lives—the complex, and challenging lives we all have—to get to the essence of who they are and what matters most. It’s called the Six Word Memoir: the constraint of six words forces you to get to the point and make every word count. In nine books of Six-Word Memoirs, I’ve had the privilege of publishing thousands of people for the first time. Unlike other aspects of life, storytelling in six words gives everyone an equal voice. This means Aziz Ansari, Steven Colbert, Dave Eggers, Julianne Moore, Chimamanda Ngozi Adichie, and Thrive’s own Arianna Huffington get six words—just like Jacqueline Rice, a librarian living in Milwaukee. The Six-Word Memoir project reminds us that every life has drama, nuance, and humor. Every life is interesting. Everyone has a story. 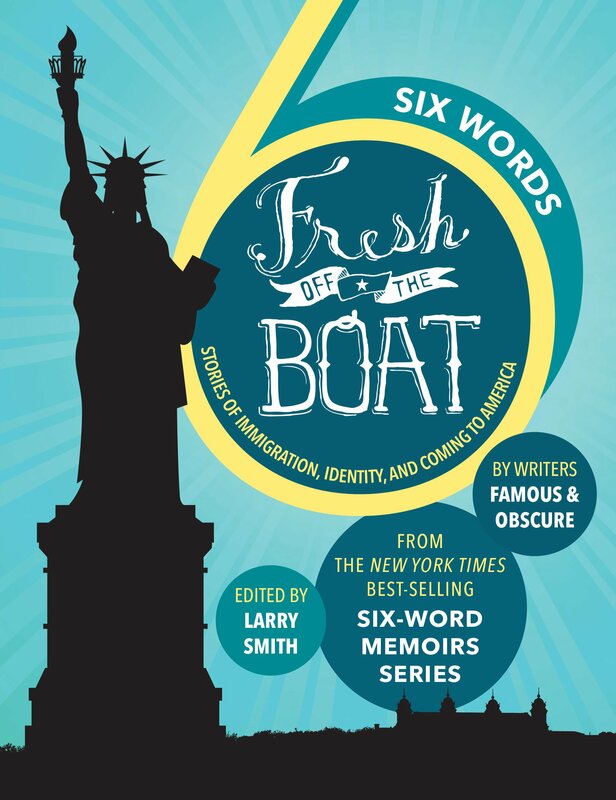 The latest collection, Six Words Fresh Off the Boat: Stories of Immigration, Identity, and Coming to America, brings me all the way back to the start—to Smitty. If identity is at the center of everyone’s life story, then the place you or your family came from is a large part of it. While immigration is a hot-button issue in 2017, what’s not up for debate is this: whether you arrived recently or generations ago, almost all Americans came from other shores. In six words: We are a nation of immigrants. Building the America of dad’s dreams. American at work, Indian at home. Sesame Street’s Olivia taught me English. Six people in trunk, five hours. I will crush the bamboo ceiling. Two on Mayflower, rest in steerage. The writer of one contribution to the book (“Another immigration, must run in blood”) is seventeen-year-old Sara Abou Rashed. Sara came to America from Syria at the age of thirteen with her mom and grandmother. She arrived in Columbus, Ohio, knowing no English, having no friends, and having to pick up a completely new way of life. Four years later she’s won poetry slams, been honored by Children’s Defense Fund’s founder Marion Wright Edelman, given a TEDx talk, and headlined a Six-Words Live story show; and she has just started her freshman year at Denison University on a full scholarship. Sara wants to study political science. She wants to change the world. And she will. I know Sara’s story because I asked her about her life. And I invite you to invoke your inner-Smitty and do the same. Ask someone to share their story about coming to America: a family member, an acquaintance, that person you see at the store (who you recognize but don’t really know); or your mailman, doctor, or Uber driver. If you get a quizzical look, it could mean the person isn’t sure where to begin. Why not suggest they start with six words? My grandfather’s story is a classic American journey: about a little boy who escaped Russia with his family during World War 1, worked his way through college, and eventually opened his own small business. These stories are everywhere. They make our lives richer. But they don’t tell themselves. You have to put down your phone and ask. “Six Words Fresh Off the Boat: Stories of Immigration, Identity, and Coming to America” is available now on Amazon – http://amzn.to/2rXLk8c. Larry Smith has written for the New York Times, ESPN the Magazine, Men’s Journal, the Los Angeles Times, and various other publications and media. He has edited nine books of Six-Word Memoirs as well as an anthology of longer essays, The Moment: Wild, Poignant, Life-Changing Stories from 125 Writers and Artists Famous & Obscure.